Do you have 'plans' for building the rain barrel base? Tks. S - I can see how it is bolted together but what does the barrel sit on? Many thanks for any help! WHERE DID YOU GET THE 55 GALLON DRUM? WHAT MATERIAL IS IT? DID YOU PAINT IT? The 55gal drum was purchased from a specialty shop, check with local shipping supply stores and such in the industry. Local garden centers tend to carry these as well! The barrel is painted to match the overall color scheme of the landscape. Thank you for your interest! Rain barrel - I love this landscaping! 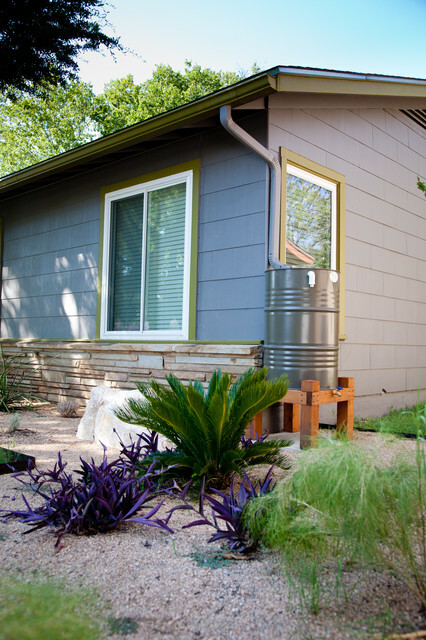 Where did you purchase the rain barrel, or is it custom made? Thank you. Thank you for your interest! This rain barrel was custom created, however, this was based off of a style that can be purchased! This was created with a simple 55 gallon drum, and cedar 4"x4" posts to created the base! This style can typically be found at your local garden centers. Thank you for asking! Source for this rain barrel? Thank you. 3. Use a rain barrel to catch water for use in the garden. This simple addition to your home can save you many gallons of water each year, depending on how much rainfall you get in your region.4. Seek out drought-tolerant and native plants. Especially important in the southwest and western U.S., and anywhere drought is a problem, choosing the native plants can reduce the need for frequent watering.Guides to gardening in your region of the U.S. Experiment with the look. At first sight, this rain barrel makes its presence known as it perches on its custom wooden stand. Though the mix of materials might seem like it would clash, it works well with the surrounding wood and stone facade of the house, architectural plantings and ground cover.